The Newbie Traveller: Don’t know how the city’s transportation works? Go and plan online! Don’t know how the city’s transportation works? Go and plan online! I think one dilemma that a traveler has when he or she arrives in a city is how to get around, which buses go where, which station do I get off. Sure taxis would always be available, but you know it would be nice if you can just spend more on souvenirs or admission tickets to popular attractions. 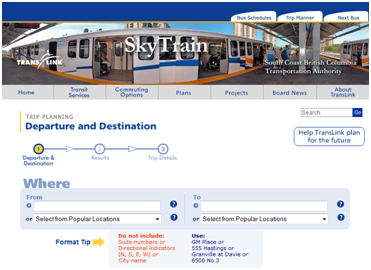 So whenever you find yourself on an unfamiliar city, just remember to go to the internet and look for the website of the transportation authority in the area you're in and see if you can plan the trip from there.